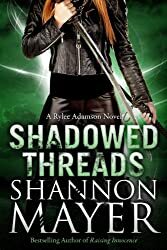 Shadowed Threads is book four of the Rylee Adamson novels by Shannon Mayer. It’s time to go after O’Shea. He can’t wait anymore. Rylee is fed up with waiting for Jack, waiting for news, waiting… So, she chases her man across Europe. While being tailed by the Beast, an unkillable Guardian trying to kill her. She meets Blaz, a dragon, on this trip. And she learns more about what happened to her sister, Berget, in all these years. So many secrets, and so many people wanting things from her. Rylee’s family chases their wayward member, determined to bring him back. Rylee’s stubbornness is legendary, and its the only thing that save her so many times. Of course, Faris and Milly aren’t going to make this easy.